The Multi-Level Conspiracy to Kill Martin Luther King, The 1999 Memphis Court Judgment. Will Justice Prevail? "The Moral Arc of the Universe Is Long, but It Bends Toward Justice"
On this day fifty years ago, on Thursday the 4th of April, 1968, Martin Luther King, Jr. was brutally murdered. He was murdered one year to the day after giving his historic speech entitled “Beyond Vietnam,” delivered on Tuesday the 4th of April, 1967. You can hear the speech in a video here. On December 8th, 1999, a jury reached a unanimous verdict in a civil trial which commenced on November 15 of that same year. The unanimous verdict was that certain parties, including governmental agencies, participated in a conspiracy to murder Dr. Martin Luther King, Jr. The entire transcript of this momentous and tremendously important trial can be read online here. The evidence that is presented in the 2,735 pages of that historic document is absolutely shocking. Every man and woman around the world should take the time to become aware of what was revealed in that trial. Additional transcripts and interviews of witnesses, as well as other post-trial evidence and analysis, can be found in the 2016 book by the attorney for the King Family in that case (who spent decades researching and investigating the case), Dr. William F. Pepper, Esquire, entitled The Plot to Kill King: The Truth Behind the Assassination of Martin Luther King, Jr.
the conspiracy to kill Martin Luther King, Jr. extended well beyond Memphis, Tennessee, and, in fact, reached into the echelons of power at the nation’s capitol. 179. The extent of the operation, which included the deployment of military surveillance units, sniper units, photographers, and federal task forces, in addition to other official agencies below the federal level (including law enforcement) is staggering. The evidence of a well-coordinated cover-up, which included the murder of eye-witnesses after the assassination itself, is also stomach-turning. Equally staggering are the implications of that multi-level conspiracy to murder Dr. King, and of the coordinated and ruthless cover-up. If one takes the time to think about what this evidence means, the implications are enormous, for every man and woman on the planet (not only in the United States). Just as revealing is the astonishing lack of attention that this evidence — presented in a court and declared by unanimous decision to indicate a conspiracy by governmental agencies to kill Martin Luther King, Jr. — has received in the eighteen years since that verdict was reached. To this day, the majority of the people of the united states are completely unaware of the evidence which came to light in that trial. The annual commemorations of the life and death of Martin Luther King, Jr. continue to repeat the standard narrative which blames the assassination on patsy James Earl Ray, despite the fact that the evidence presented in the trial, and additional evidence and confessions which came to light after the trial — as well as the unanimous verdict of the trial itself — completely demolishes the standard or “official” narrative. All of this evidence — and the verdict itself — are conveniently and deliberately ignored by the media. This fact is evidence of yet another conspiracy: the control of the media. The evidence for the control of the media — and the willingness of the media to participate in what can only be labeled as outright propaganda — is made completely clear by this case of the murder of Dr. King, and the persistent refusal of the media to report on the evidence from a case that took place in 1999 which absolutely destroys the narrative which the media continue to obediently present to the public. Within twenty-four hours, the mighty Wurlitzer of the powerful private and public interests involved was in full volume. Analytical pieces suddenly appeared criticizing the judge, the defense counsel, and the jury. The trial was diminished in importance, and journalists blandly asserted that nothing had changed. To counter the inevitable spins, the closing arguments and the summary of the plaintiffs’ case went up on the website of the King Center (thekingcenter.org), and arrangements were made to put the entire transcript on the site. A leading publicist of the government’s position and the official line, Gerald Posner, was everywhere at once. On one television show after another and with a nationally syndicated op piece, he insisted that the King family had been duped and that the trial was a farce. I was able to publish a strong rebuttal of his banal generalizations only in the Washington Post. The New York Times allowed me two hundred words to respond to a one-thousand-word piece by a former US attorney general. What was ludicrous about all of the criticism was that none of the critics had attended the trial or heard the evidence. Of all the media professionals commenting on the case, only Wendell Stacey, the local Memphis anchorman, at the risk of his job, attended court every day. At the end, he repeatedly said he was totally convinced that the jury was right and that he had never been so ashamed of his profession. Though the lockstep media conformity was expected by all of us, it was nevertheless sad to see it at work again. In the end, the predictable performance of the media had been heralded by the testimony of William Schapp [sic, although spelled “Schaap” in the court transcript linked above] as he laid out the practice of government manipulation and the use of media for propaganda purposes. The King assassination and the search for the truth were a national security matter, and as such the mass and reputable fringe media would be effectively controlled in all aspects of coverage. 208. You can read the court testimony of William Schaap for yourself, beginning on page 1,558 of the linked transcript above. Mr. Schaap’s credentials are presented for the court record on page 1,559 and include being a practicing lawyer and graduate of University of Chicago Law School, practicing law since 1964, specializing since the 1970s in military law, practicing military law in Asia and Europe and serving as editor in chief of the Military Law Reporter in Washington, as well as acting as staff counsel for the Center for Constitutional Rights in New York City, and as a professor at John Jay College of Criminal Justice of CUNY. Half a day was occupied with the testimony of attorney William Schaap, who we qualified as an expert on government use of the media for disinformation and propaganda purposes. After providing the jury with a survey of these practices by governments throughout history in a detailed question and answer exchange, Schaap introduced the court to these practices of the United States government in other cases, or issues, where intelligence and/or national security interest were believed to be involved. A number of examples were cited. One, for example, involved a CIA propaganda story that was spread all over the world and widely believed for four years [ . . . ]. In fact none of the above was true. The story was revealed by the agent who promulgated it to be false and to have been totally concocted at the CIA station in Zaire and disseminated through the extensive worldwide agency network. Schaap revealed that his research clearly indicated that the agency alone — not to mention its counterparts in the rest of the American intelligence community — owned or controlled some 2,500 media entities all over the world. In addition, it had its people, ranging from stringers to highly viable journalists and editors, in virtually every major media organization. As we had seen and were indeed experiencing every day of the trial, this inevitably resulted in the suppression or distortion of sensitive stories and the planting and dissemination of disinformation. 185 – 186. Everyone should take the time to read that summary several times until its implications can be absorbed. Indeed, it might even be best to copy it out by hand, in order to prevent the brain from skimming over it in order to avoid the implications of what is being explained. Then, take the time to read Mr. Schaap’s testimony in the 1999 trial. The fact that the media has completely suppressed and refused to report on the evidence presented in that trial, and the verdict that was reached, is very powerful evidence indeed that exactly what is being alleged above (“the suppression or distortion of sensitive stories and the planting and dissemination of disinformation”) is taking place to this day. Nevertheless, the majority of the men and women in the U.S (and perhaps in other countries as well) continue to believe that nothing is true unless it is repeated to them by the authority-figures in the media. I highly recommend that everyone who has not yet done so also take the time to listen to some of the interviews that Dr. William Pepper has given since the publication of the above-linked book, which are available on YouTube and on numerous podcasts. Two of those are linked in this previous post. Others can be found by searching for William Pepper on YouTube or on podcast directories such as iTunes and others. A true revolution of value will soon cause us to question the fairness and justice of many of our past and present policies. Fifty-one years later, we can all see how perceptive Dr. King’s words were in that speech delivered in 1967, and how applicable they remain to this day (in part because Martin Luther King was deliberately silenced by forces who did not want that “far deeper malady within the American spirit” to be addressed in the way that Dr. King was addressing it). One day after the verdict was delivered on December the 8th, 1999, the late Coretta Scott King and her children gave statements regarding the momentous trial and the evidence that was presented and the decision that was reached. Their statements deserve to be read in full, not only for their own sake but also because the controlled media has been allowed to use all its considerable powers to try to drown out the real message of what that verdict and that trial really tell us. Coretta Scott King and her children gave their statements regarding the message of that trial and the evidence it presented and the verdict that was delivered. Trasncripts of those statements can be found, in their entirety, online here. As we pursued this case, some wondered why we would spend the time and energy addressing such a painful part of the past. For both our family and the nation, the short answer is that we had to get involved because the system did not work. Those who are responsible for the assassination were not held to account for their involvement. This verdict, therefore, is a great victory for justice and truth. It has been a difficult and painful experience to revisit this tragedy, but we felt we had an obligation to do everything in tour power to seek the truth. Not only for the peace of mind of our family but also bring closure and healing to the nation. We have done what we can to reveal the truth, and we now urge you as members of the media, and we call upon elected officials, and other persons of influence to do what they can to share the revelation of this case to the widest possible audience. 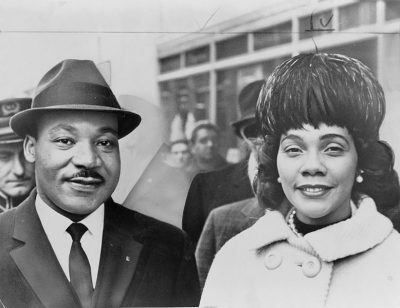 Those who continue to suppress the truth of what took place on this day in 1968 — and to suppress the truths that came to light in the 1999 trial — are placing themselves on the wrong side of that moral arc of the universe, and on the wrong side of the justice of which Martin Luther King and Coretta Scott King spoke and for which they fought. Dr. Martin Luther King, Jr. (and many others) fearlessly pursued aggressive nonviolent action in service to justice and truth and the inherent human dignity possessed as a birthright by each and every man, woman and child. It is our responsibility to continue their struggle, knowing that these principles are indeed aligned with the justice which originates from a realm beyond this material realm, and that this justice cannot be delayed forever. David W. Mathisen is the author of seven books about the connections of the world’s ancient myths to the stars. His website can be found at www.starmythworld.com.